THE MIRICALE VERSATILE USE PLANT HEMP… vs cotton farming destroying our river ecosystems..
Due to recent media attention I first wish to reveal the damage to our water river ecosystems as a result of glutenous use of our water recources and the fraud perpetrated by cotton growers… misuse of governmemt funding by them.. here are several reports detailing this! Here's how the $13 billion plan to save the Murray-Darling is being undermined. A must-see report on the Darling River scandal. The death of the Darling River – a disaster brought to you by the worst of politics and massive buck passing. Don't look away. Don't let them get away with it!Thanks to Channel 10's The Project for travelling out to Menindee for this special investigation. This pipeline is the death sentence for the Darling River.Did you know the NSW Government has spent $500 million building a pipeline to replace the Darling River? They justified the pipeline by rapidly draining the Menindee Lakes twice, which has led directly to the mass fish kill in the Darling River. I visited the construction site early last year and make no mistake, this has been a deliberate plan by the government to turn the Darling River into an irrigation ditch for big cotton irrigators in the north.I've been following this issue for years and raising it in parliament. The National Party must be thrown out at the ballot box for this national disaster. 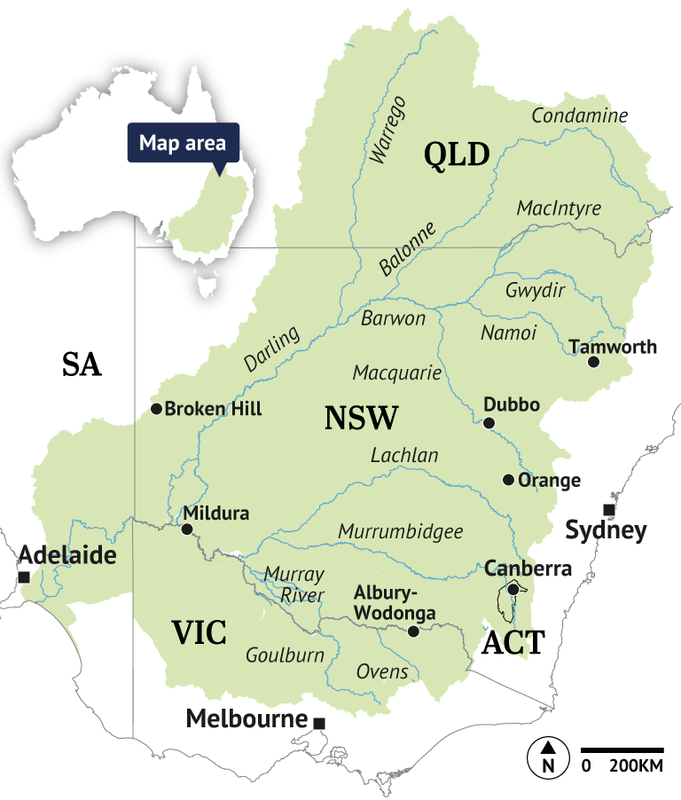 The advice from Fisheries NSW was issued after it reviewed a draft version of the 2012 Barwon Darling water sharing plan and described the river system as a “key fish habitat”. It flagged concerns the draft plan was based on a series of outdated flow classes developed over a decade earlier, even though river flows had plunged by as much as 73 per cent in some areas since then. On Sunday NSW Opposition Leader Michael Daley seized on the document as proof the mismanagement of the river system was to blame for recent fish kills, which he slammed as a “an international embarrassment for Australia”. FYI – this is an aerial shot of the diversion in place on Cubbie Station a flood irrigated cotton farm in South western QLD, owned by the Chinese who have an allotted water storage allocation of 460,000 mega litres of water (of water from the Culgoa), there’s not even a number big enough to convert that to litres (4.6e11 litres)! But it is 460,000,000 cubic metres of water, to flood irrigate 22,000 hectares of Cotton farmland! PS they also get more water allocation on two other properties from the Beardmore Dam! If your one of the fools who believe the drought is causing the magnificent stock pile of fish to die and the river be full with stagnant water and BlueGreen Algae you are being mislead! How is a river system supposed to survive with a water diversion, built on a bend that’s clearly ATLEAST 4 times bigger than the river it’s self! Those that are saying “they only take water when it floods”, are they not aware the flood plains in this area are designed to flood the Artesian Basin, that covers 22% of inland Australia from FNQ into SA, the Underground stores of the Artesian Basin feeds the Murray Darling river system in times of drought, and the friends is how the fish have stayed Alive through drought in the past, simple environmental stuff taught to the general public in primary school! Wake up every one, the Murray Darling basin and the artesian basin, where Cubbie station is based is the first and major feeder to the Murray river in Victoria and South Australia, and it’s dying, this will effect you! This has been happening for 10 years or more! Long before the current government, but the current government do need to act NOW! This WILL affect us all! We will not cope as a nation with out the Murray! If you live in NSW, Victoria or South Australia this will affect YOU! If you like fishing, camping, skiing and boating on the river this will affect you! If you are a vigneron or rely on the Murray for water this will affect you! If you like a green lawn and nice garden, this will affect you! If you like wine, almonds, stone fruit, Citrus and fruit and veg this will affect you! I DONT CARE IF YOUR SICK OF SEEING POSTS ABOUT THIS! Get sharing folks! It’s time we move, this IS devastating now and will be more so in the near future for more than just the farming communities based on the Murray Darling Basin this will affect our entire country and it’s people! Those lines in the below photo are irrigation lines! Cubbie station diverts entire rivers, the Culgoa and Balonne, into its dams. This foreign owned firm has water storages 28 kilometres long capturing 460 billion litres of Murray-Darling headwaters. Meanwhile, farmers downriver can have a BBQ on the Darling. You never voted for this, as you do not have power over where your vote ends up, time to change that, then change this. Mayors from river drought effected regions meet up in Canberra to discuss the water crisis and the minister’s did not attend.. Yesterday, the NSW Government released an internal report on the cause of the fish kill. The report only looks at the immediate cause of this man-made disaster, not the mismanagement and mal-administration of the Darling river and its tributaries which led to this. We all know the immediate cause was blue-green algae, but there should never have been the circumstances that let it thrive, there should be water in Menindee Lakes and a sustainable flow down the Lower Darling. It is time that the employees of the NSW Government that know this appalling coverup is being done to stand up for future generations and fight to save our native fish and our rivers. Our politicians can’t be honest, but we need those who know the truth to stand beside us and save the Darling and every living being that depends on it before it is dead for good. The productivity commission confirms what we have all know for some time, the MDBA senior management has failed the communities,the plan and the Rivers. We again ask for Neil Andrews and Phillip Glyde to stand down. And appoint quality river professionals such as Bill Johnson and Mary Anne Slattery back into the mdba to regain integrity and assist the plan going forward. Based on the Royal Commission findings you would hope heads would roll over this, and roll straight into prison…. Wonder if the Cotton and Rice boys had their fingers in this pie? together to irrigate vast lands in the central Australian region. Well thought out OLD SCHOOL. Not greedy Chinese destroying Rivers. His office initially issued a defensive statement about the final report by Commissioner Bret Walker SC, saying the government would take time to “fully consider” the 746-page report, and that “the gloves are off when it comes to fighting for our water rights”. The joint statement with Primary Industries Minister Niall Blair said rural communities “need certainty” rather politically-charged inquiries. “What they don’t need is hysteria, legal challenges or more politicking from NSW Labor and their South Australian counterparts or worse still, the inaccurate vitriol that comes from the likes of the Australian Greens Senator Sarah Hanson-Young,” the statement said. “I think one of the best comments to come out of today was a royal commission, where you actually can cross borders, cross jurisdictions and get a clearer picture of the whole … basin plan,” Mr Barilaro told the gathering. Chris Minns, Labor’s water spokesman, said the government needed to get its story straight. “It beggars belief that after three years of refusing to allow a royal commission to get to the bottom of this mess [Mr] Barilaro has thrown his minister under a bus and is now calling for one,” he told the Herald. The report had also painted “a picture of a river lying in ruin”, and clearly criticised the plan to re-engineer the Menindee Lakes, a move support by other basin states and the Murray Darling Basin Authority, Mr Minns said. Recommendation 7.9 of the report said the Menindee proposal “does not present an organised, comprehensive, consistent or persuasive case for the project”. The Department of Primary Industries updated its fish death notice on Thursday. It said four tonnes of dead fish, mostly bony herring, had been removed from the Menindee weir pool on the Darling, following this week’s kill. It has come to my attention through social media the following news post! Why are our governments always lying to us. Here is the report about what happened in Menindee and all the fish killed. I can’t sleep. Those who know don’t sleep. I get plenty don’t worry. We had independent scientists test the waters not the typical Gov CSIRO and these were the findings. Had to copy and paste sorry will get the report if you need it. Ok I just worked out what happened. The Chinese run Cotton farm has been using Chinese branded 24-D on their crops which is highly contaminated with the deadly chemical 2,3,7,8-tetrachlorodibenzo-p-dioxin TCDD. This dioxin is what is killing the fish. It is toxic to humans at ten parts per trillionth of a particle and has a half shelf life of two hundred years. This dioxin is responsible for contaminating more than half of Australia. I have told the APVMA and all the Government ministers of this contamination already but they are still in the denial stage. Hopefully someone from the Royal Commission gets to talk to me so I can explain how I definitely know without a doubt that all fish kills are caused by dangerously high levels of TCDD. The Farmers are innocent bar any that used Chinese chemical they brought in themselves. It is the Government that got it wrong at all levels and let this impure 24-D be sold country wide. The APVMA is doing what it can to change this impurity and stop the contamination but the damage is already done and wont be able to be fixed for four hundred years. Any soil or water that had spraying over the last sixty years of the chemical 24-D is contaminated with TCDD at levels dangerous to humans. This dioxin is known to cause over fifty types of cancers and more are being listed every year. It is about time the Government came clean and told everyone it is in every drinking water dam in Qld and most of Australia. That is the chemical that is responsible for the rise in cancers and still births in this country. Something has to be done but all Governments are refusing to accept my accurate information. I have written to Mr Little proud myself regarding this contamination and it’s enormous consequences but he only replied once and left it in the hands of the APVMA. I warned him this would happen and there would be major fish kills first then major human cancer outbreaks and deaths. The Government still wont listen and go on ignoring what they have done. Maybe Mr Littleproud calling a Royal Commission is the Governments way of explaining all this to the public. Found this on another page. Thanks James, I Think We All agree as to what has occurred. But those in Our parliament cant see further than their back pockets. Communist China has used their ” farming methods ” on Our soils, but the Government will not admit it. Hemp versalite, uses 4 times less water than cotton growing. « Yellow Vest Rally 19th January Australia Wide!! BE THERE NO EXCUSES! !